This is Steve Dunn’s seventh naval history book, and with two more already in progress, you’d think there wouldn’t be many aspects of the Royal Navy’s WWI exploits the Barnt Green author hadn’t already covered. . . but here yet again he has created a fascinating tribute to those involved in another little-remembered theatre of the war. This time it’s the battle for trade in the North Sea, which caused no end of political and tactical headaches for the British Government and the Admiralty, not to mention the Scandinavian countries themselves. There’s comprehensive coverage of the convoy system designed to protect merchant ships, beset by accidents, collisions, “friendly fire” and deadly U-boat attacks. As well as the tales of shipwreck and survival, plus vivid descriptions of the tough conditions aboard the destroyers, Dunn presents a detailed analysis of the failures and successes. As ever, it’s the stories of individual characters, weaving together extracts from diaries, letters and ships’ logs, that lend humanity to the statistics. Minute details paint pictures of everyone from the top brass to the lowliest deckhand, and beside the tragedy, bravery and compassion, there’s room for the odd chuckle at such things as a House of Commons row over herrings, the British variety performers sent to Stockholm as propaganda, and the shipwrecked sailors barred from a hotel until a consignment of soap was brought to clean them up. The book concludes with a look at who gained and lost the most from the conflict, and how the roots of next one were already taking shape. 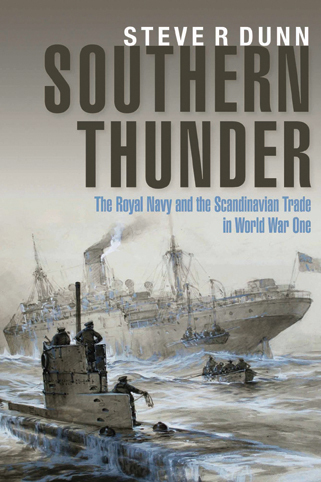 . .
Southern Thunder is available via Amazon and local bookshops.